LG is working on a new smartphone with 16 lenses fitted onto the back of the device, according to a new patent spotted by Dutch blog LetsGoDigital. The patent was filed by LG with the USPTO (United States Patent and Trademark Office) and was granted on November 20. Apparently, the patent was filed by the South Korean giant in 2014 but only recently made public. The patent explains that the 16 camera lenses on the back of the phone are arranged in a curved matrix arrangement that will allow the user to capture an image from multiple angles at the same time. The camera software will then play back all the different photos in a ping-pong loop. This will allow the user to choose either a single image of the 16 or combine all the images captured by the lenses in a moving scene. “You can also select a head of a person or object, after which you can turn it into almost any desired position”, notes the patent. Another very interesting feature is that the users can use the multi-image feature to cut out a part of the image and replace it with an image taken by a different lens. It also allows the user to combine several parts of different photos to make an image. “If any one of the graphic objects…is selected, the image of the select part, that is, the image of the head part may be replaced with a part of the image of taken from any one of the lenses corresponding to the rotation direction selected by the user,” adds the patent. Other than the 16 lenses and the flash, the smartphone would also feature a mirror on the back that can be used to take a self-portrait (high-quality photos) using the main camera. The new design could possibly be used in a foldable phone or any other kind of form factor. Please note that this is just a patent, and only a few of them end up as a finished commercial product or even a prototype. 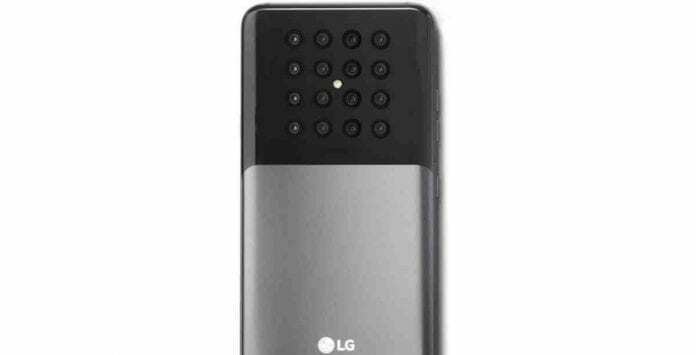 Whether or not, will LG go ahead and implement the new design in its future devices, only time will tell. Just recently, Samsung had launched its Galaxy A9 (2018) smartphone that features a four-camera setup on the back.